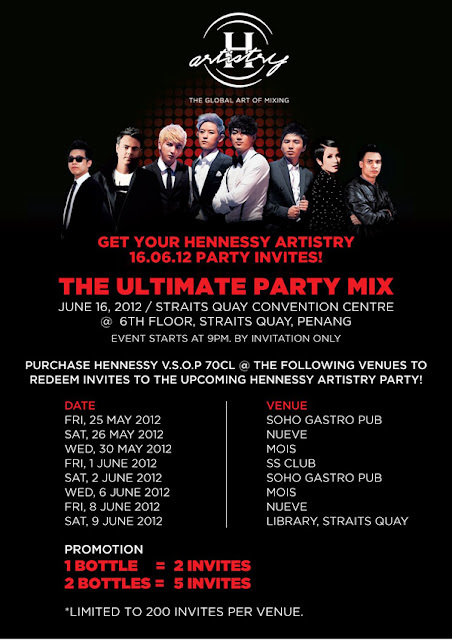 Hennessy Malaysia is bringing the H-Artistry again this time over in Penang. Now I've always had the chance to catch the previous H-Artistry events last year, and they were good. The premier super-clubbing Artistry is back this year with three explosive parties; the first of which is set to rock Penang on the 16th June 2012 at the Straits Quay Convention Centre. This post shall serve as a pre-writup to this upcoming H-Artistry, one which I would gladly attend as it is being held at my hometown Penang. Featuring an all-new Art of Mixing Zone, signature Hennessy V.S.O.P. 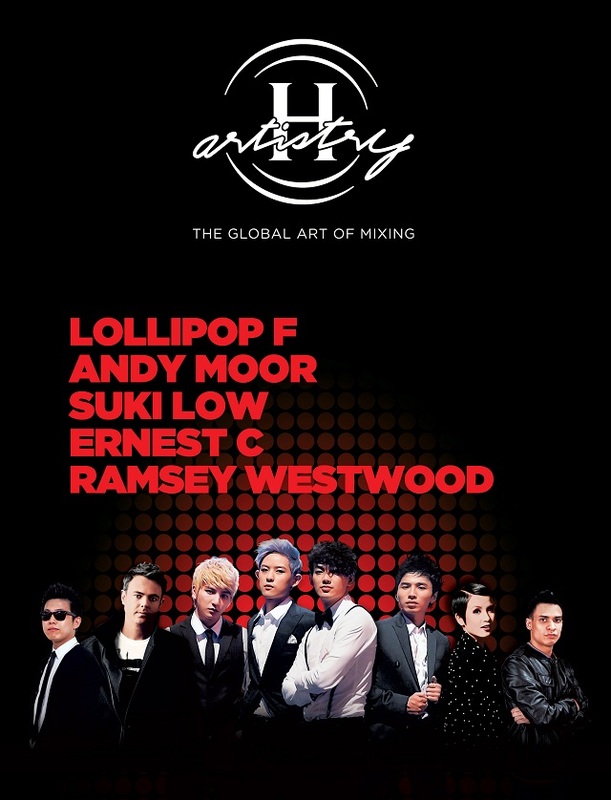 long drinks and the trademark H-Artistry party atmosphere, revellers and music lovers in Penang are in for a truly explosive experience this 16th June. The first H-Artistry of 2012 will see chart-topping Taiwanese mandopop sensation Lollipop F and UK's Grammy Award nominated DJ Andy Moor headline the event, alongside the best of Malaysia’s local talent such as Suki Low, Ernest C and Ramsey Westwood. More than 2,000 partygoers are expected to converge at the SQCC to party at the island’s newest and most happening waterfront, making H-Artistry in Penang the biggest super-clubbing event to take place on the island. Taking on a sexier image after the release of their second album “Dance” in October last year, Taiwan’s heartthrob boy band Lollipop F is set to take over Asia and beyond with their energetic sound and crisp dance moves. Known as one of the best singing/dance groups hailing from Taiwan, Lollipop F have been taking the Asian mandopop scene by storm with chart toppers such as “Dance” and “Trophy”. Grammy-award nominated Andy Moor from the UK is a groundbreaking DJ and producer in the electronic dance music scene. In his illustrious career, Moor has established a distinct, edgy and creative sound that is all his own with hits such as “Halcyon”, “Air For Life’, “Fight the fire”, and “Fake Awake”. In 2011 Suki delivered yet another sensational performance at the most anticipated H-Artistry party of 2011 at the Malaysia International Exhibition and Conventoin Centre, expertly taking on Fergie’s vocal portion of the hit song ‘Gettin Over You’ while sharing the stage with headliner Chris Willis. Since then, Suki Low and Chris Willis have collaborated on the production of Suki’s latest single ‘Finish Line’ which has just been released this April. Ernest C, dubbed by partygoers as “The Miracle Boy”, is one of the youngest Malaysian DJs to spin in renowned clubs around Malaysia and other destinations around the world, not long after his DJ-ing debut at the tender age of 17. Ernest C is versatile with his selection of musical genres, which range from Disco House to Electro. Ramsey Westwood a.k.a Spinmaster Champion 2011 is naturally gifted behind the decks, showcasing some of the most original mixes Malaysia has ever heard. His fluid style won him the “Spinmaster” title in the coveted Astro Hitz Spinmaster Season 2 competition, which propelled him all the way to London to be the first Malaysian DJ to perform at the Ministry of Sound. Hi, I live in ukraine but I have decided to create the blog for American audition. Can you visit it and give me some advises how to improve it? wow!! seems like got many fans..
Wah! You will go back just to attend it? Great, can ta pau some laksa and char koay teow from Lorong Selamat for me! Kekekekekekeke! Just kidding! I heard about H-Artistry but you are sharing more details here! Have fun bro!